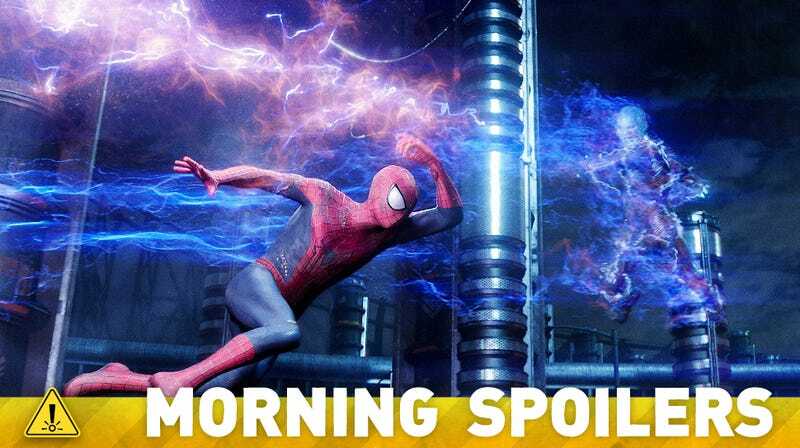 Will the first Amazing Spider-Man spin-off star a semi-reformed baddie? Max Landis wants to add a little Cthulhu to a Houdini biopic. True Blood has recast James. The movie based on Ted Chiang's Story of Your Life has a director. Learn how The Purge 2 will turn the first movie's premise on its head. Plus watch brand new trailers for The CW's The 100 and Star-Crossed, and Syfy's Dominion. Spoilers now! Sony wants to do a slew of movies in the same world as this film, in the vein of the Marvel Cinematic Universe — but who can carry a film besides Spider-Man himself? Given that Sony only has rights to Spidey, his supporting cast, and his villains, it seems likely that one of those villains could be promoted to protagonist. There's been examples of that even on TV — Vic Mackey on The Shield, one of the greatest antiheroes of all time. There are ways to milk that story. Audiences have seen everything. They've seen all the good guys who never do anything wrong. Is there a story in seeing the other side? That's the challenge, and that's the fun. I'm not sure how we're going to do that yet. Because Peter becoming Spider-Man came out of [Oscorp], rather than saying, 'And then this alien came from space,' or whatever, they're doing human-hybrid, weird stuff at Oscorp. That's where Gwen Stacy works anyway as well. So the idea of it representing the good and the bad of science, that it can do great things, but it can also mess you up and do weird things and transform people — as all science can be used good or bad. So it's nice to have that organizing principal, but it wasn't like, 'We must keep it at Oscorp.' It flowed naturally from the story development. With the sequel, I thought they had a really great way to do a sequel because the first one took place in an upscale suburb with what happens to a family there when their security system doesn't work. With this one, there's none of the same characters, but it's the same day of the year and it takes place in the city where there are no security systems and it's just like a war zone where people are just trying to survive. So I thought it was pretty interesting to take that concept and to look at it from a different angle. I saw concepts of all the Dinobots. People who like dinosaurs will go nuts with Transformers 4! So Marie has been knocked unconscious. What can you say about what will happen to her? Basically what she was going to do to Kathy Bates, which she did — Marie cut Delphine into many, many parts and threatened to scatter her around the city — Kathy does that same thing to Marie. Marie is still alive, but her body parts are scattered all over the city, perhaps never to be united again. The question in the next episode: Who can put this very glamorous Humpty Dumpty back together again? So will we see Angela Bassett as just a head? No. You'll see Angela Bassett again in the next episode, but that's the question. It was always going to be Marie against Delphine. The next episode addresses what will become of this rivalry and who will win, ultimately. That's really what it's about. The time comes for the girls to face the test of the Seven Wonders. The night before, Myrtle serves them one last meal together as equals. It's time to find the new Supreme, a witch who Cordelia hopes "can lead the way out of an era of strife and chaos, towards repair and rejuvenation." With the Witch Hunters gone, perhaps they'll even be able to live in the open. As morning dawns, Madison is feeling vulnerable yet full of steely determination, Queenie struggles to believe she could be the one, Misty is terrified, and a sober Zoe puts on dark lipstick like it's war paint. The trials begin, and Madison aims snarky barbs at Zoe – followed by more violent intent as the trials go on – while Misty is surprised to find herself giddy at her own successes. But tragedy strikes as the trials go very wrong. Later, as the new Supreme finally rises, she finds herself having to begin her reign by performing a heartbreaking task. And finally, before the Coven can return to strength and prominence, there is one last piece of unfinished business for the new Supreme to attend to. Stephen will basically learn about what forced his father into this limbo, this exile. He'll get two accounts of what went down. He'll get one from Jedekiah, and he'll get one from The Founder. We have these twin heads of Ultra – Jedekiah being human, and The Founder is obviously paranormal – they're both sort of vying for Stephen's loyalty, and they both realize that Stephen's instrumental for [their] secret agendas. The fun of the back half is you have these two terribly untrustworthy, duplicitous, manipulative, dangerous dudes just trying to win Stephen over to their side, and the truth is he can't really trust either of them. The stakes will become so much more than just bringing his father back. It's a case of history repeating itself where Stephen will find himself placed in the same dilemma that his father was facing and realizing that his father basically arranged to fake, or in a way to actually stage his own death, in order to avoid this terrible plot. That will give you some notion of the stakes Stephen finds himself at the center of by the end of the season. The new component that we explore in the back half of the season is John and Stephen becoming close as friends, and the idea that the fact that they're romantic rivals doesn't prohibit them from becoming really close to one another. I just think that's what makes the triangle really interesting is that it's very nebulous. There are no good guys and bad guys. It's true, love is blindness. It (the book) only came out not that long ago. I hope they would love it. I know Kass is a fan of the show. [Their appearance] is not just about them being pretty and handsome… they should be relatable to us. . . . Small differences are enough to drive a a wedge between you and society at large. [O]n the face of it it seems like one thing, but it's quickly obvious that the show is more than a teen romance. . . . [The show incorporates] sci-fi stuff in a big way. . . . [In 2014, racism] is in some ways worse than ever. Guest starring are David Conrad as Ian Quinn, Carlo Rota as Luca Russo, T.J. Ramini as Mancini, Ludwig Manukian as the Conductor, Emily Baldoni as Sofia, and a special cameo appearance by Stan Lee. Burbank, CA (January 15, 2014) – Caleb is thrown when his Rosewood ex Hanna shows up in Ravenswood, in "My Haunted Heart," the winter finale episode of ABC Family's original series, "Ravenswood," airing Tuesday, February 4th (9:00 – 10:00 PM ET/PT). Caleb finally has to clue Hanna in to some of what has been happening in Ravenswood when she shows up demanding to speak to Miranda about "stealing" him away. Luke and Olivia finally learn what really happened to their father and who was responsible. With the walls closing in around him, Dillon makes a drastic move. And when Remy goes missing, the rest of "The Five" are desperate to rescue her, leading to an intense showdown with everyone's lives in peril.